Bergen Pediatric Speech Therapy offers both individual and group speech intervention for children in a warm and friendly environment. 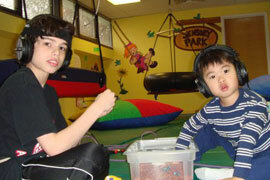 The child’s assessment and therapy sessions are provided in our facility or in the home. Observation and consultation with a child’s school is also offered. Our team offers expertise in articulation, language, oral/motor, motor planning, voice, and written language. Each child’s therapy program is tailored to his/her unique needs. We carefully plan programs for our children, and educate parents and caregivers in order to facilitate understanding and coordinate efforts, in order to achieve optimal results of the child’s therapy program. Parents are a vital component in their child’s therapy process and we maintain an “open door” policy during sessions, continuous program review, and contact with other professionals that are part of the child’s therapy program as needed. Learn more about Speech-Language Therapy.